Patrick brought Evance from his home town located in the Western Region. His mother and Joyce's mother are sisters making them cousins. When Patrick went to pick up Joyce, he discovered that Evance was truant. Most of the time he wandered and slept on the streets, hanging around individuals who were doing drugs. His Grandmother pleaded with Patrick to take him with him as well. They eventually found Evance in the forest hanging out with the drug dealers. Evance has an aunt that lives in Kasoa. When he first arrived it was decided he would stay with his aunt and attend the Savior Children Foundation school. Unfortunately he would never come to school. When this behavior continued Patrick went to find him. The aunt told Patrick that he was not coming home as well. It took Patrick 3 weeks to find him. He eventually found him at the New Market pushing wooden carts for customers making only tip money. It was at that time Patrick insisted he come live at the orphanage. 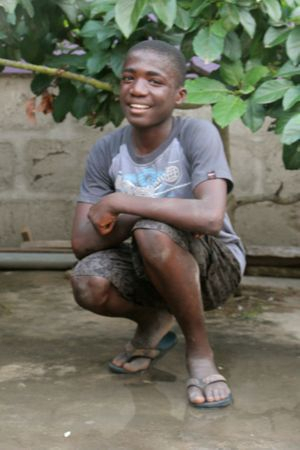 Evance is now doing great in school and is always a great help with chores. He now spends his days at the orphanage but does go to his aunts to sleep at night. He keeps changing his mind about his future plans.